This chapter assumes that you are familiar with InterSystems security as described in the Security Administration Guide. In particular, it assumes that you understand the relationships between resources, roles, and users. If you install InterSystems IRIS™ with the Minimal Security option (and if you do not tighten security after that), the user UnknownUser belongs to the %All role and has access to all parts of Business Intelligence. In this case, ignore this chapter. Also note that you use Business Intelligence from within a web application. By default, a web application can access a subset of InterSystems classes, which does not include the %DeepSee classes. To use Business Intelligence in your web application, you must explicitly enable access to Analytics. For details, see Setting Up the Web Applications. For details, see “Requirements for Common Business Intelligence Tasks,” later in this chapter. The user must have access to the database or databases in which Business Intelligence is used. Creates a resource with a name based on the database name (%DB_database_name). Establishes that this resource controls access to the new database. Creates a role with the same name as the resource. This role has read and write privileges on the resource. You can specify whether the read and write privileges are public. These privileges are not public by default. For example, suppose that you create a database called MyApp for use with Business Intelligence, and you let InterSystems IRIS create the resource and role as described here, and suppose that the read and write privileges are not public. In this case, a Business Intelligence user must belong to the %DB_MyApp role, which has read and write privileges on the %DB_MyApp resource. If the ^DeepSee globals are mapped from another database, the user must also have access to the database that contains these globals. The following table lists the security requirements for common tasks, in addition to the items in the previous section. Note that the system displays all widgets to which the user has permission. That is, the dashboard is displayed even though the user cannot see all of it. *Also see the previous section. Note that in your resource definitions, some of the permissions might be public. For example, in a minimal security installation, by default, the USE permission is public for all the Business Intelligence resources. **If a cube contains relationships to other cubes, those cubes are secured separately. A user must have USE permission for all of them in order to use the relationships. Similarly, a compound cube consists of multiple cubes, which are secured separately. Create a resource in the Management Portal. Use the Resources page (select System Administration > Security > Resources). Create a role in the Management Portal. Use the Roles page (select System Administration > Security > Roles). This role should have USE and WRITE permissions on the resource you just created. Or you could create one role with USE and WRITE permissions and another role with only USE permission. For a dashboard or pivot table, when you save the item, type the name of the applicable resource into the Access Resource field. To save a dashboard or pivot table, you must also have the USE and WRITE privileges for the appropriate Business Intelligence user interface component, as described in the previous heading. For a cube, subject area, or listing field, use the Architect to specify the resource that secures that item. For a listing defined in a cube definition, use the Architect to specify the resource that secures that item. For a listing group or for a listing defined in a listing group, use the Listing Group Manager to specify the resource that secures that item. For a KPI, edit the class definition in Atelier. Use the name of the applicable resource as the value of the RESOURCE class parameter. Assign users to roles as needed. The item has no owner (specified as the Owner field). You are the owner of the item. You have USE permission on the %DeepSee_Admin resource. 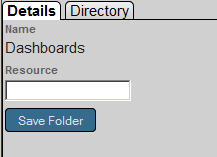 Click Analytics > Admin > Folder Manager. Click the check box next to a folder. In the left area, click the Details tab. Type the name of the resource.